I discovered the SERENA AND LILY OUTLET on San Pablo Ave at Bancroft last Spring. I recently found a beautiful Bamboo hanging chair that I'm considering hanging in my living room, but would be perfect for any of my clients' gardens. It is important to relax in a garden, even though I rarely point this out in Cutting Back (garden memoirs tend to be pretty active). 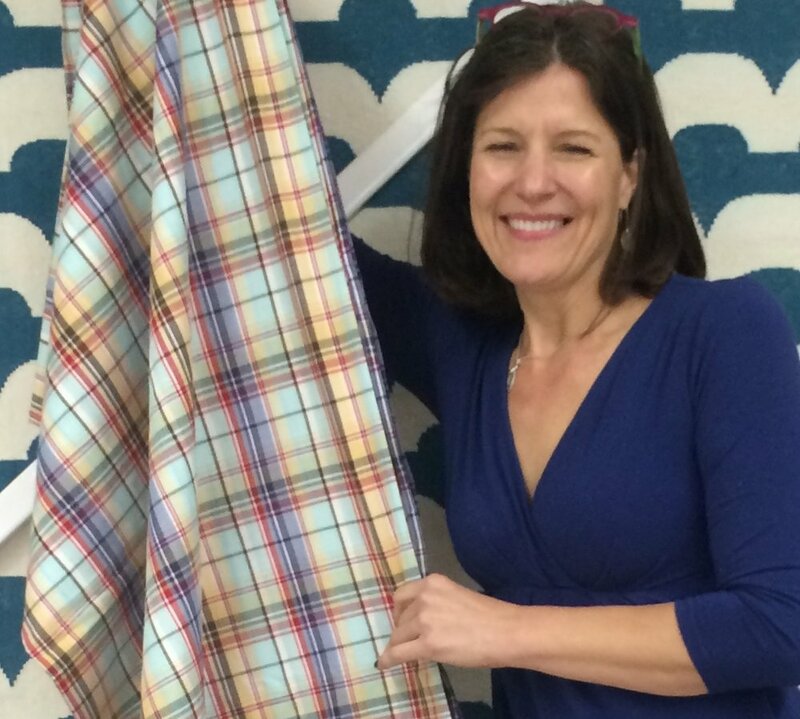 I can't use any other sheets once I purchased (at a reasonable price for the quality) a set of Serena Outlet sheets, and not just because they are plaid, since those of you who know me, know that I am addicted to plaid (I like to think due to my Scottish-maternal lineage). I love popping into the shop, which always has something different given it is the outlet for the main store. I'm transfixed by their bamboo/wicker items, modern print rugs (got one of those) and many items with a style which echos nature. Sometimes I just like to look at design shops to get ideas for the future, or just to look at something beautiful, designed by a craftsperson. Even if you just "like to look," I highly recommend them for Bay Area locals, and out-of-town visitors! The store is near 4th Street Shopping, and quite near "VICS" fantastic Indian food for lunch, and the Oaktown native plant nursery, both at Channing and 4th Street. Sammy is posing on one of their sheets for you! They are my choice community store of the month. If you'd like to see more of my favorite Bay Area stores which feature nature on Facebook: #firstofmonthcommunityfirst. People in the store are really friendly, I must say. Traveling through England in September on the last leg of a Marseille/Giverny trip, I happened to drop into a local bookstore, The Bell Bookshop, in the nature-rich river town of Henley-on-Thames (pronounced "Tims" as I was constantly corrected by locals), near Oxford. I entered the shop to obsessively browse English garden books, and after barely mentioning Cutting Back-My Apprenticeship In The Gardens Of Kyoto, they ordered it on the spot! Hence, Bell Bookshop, a fifty-year-old independent bookstore became the first bookstore in Europe to carry my memoir. Thank you Bell Bookshop for having faith in a woman's garden story. A big part of Henley is seeing rowers on the Thames River, dusk to dawn, in preparation for the annual Henley Regatta race. Strong men of all ages (not that any girls were looking), row with vigor and loud breathing. I witnessed as many female crews, including several sightings of the "women over 80's" boat (so cool and inspiring!) out just after sunrise. These long boats, filled with one, two or more rowers fly down the river, barely avoiding "The Queen's Swans" who refuse to budge for these human paddlers needing a boat to float. Bikers and walkers journey up and down vast walking paths on either side of the Thames ("Tims"). Although it is frowned upon, sometimes the coaches ride bikes rather briskly along the path, yelling instructions to rowers. It's mesmerizing to watch training in progress, but it is best to step out of the way. There are trees and all sorts of flowering plants lining the river with a tinge of orange or yellow fall color in early September. I got to take a field trip with a local arborist, Hugo London of the English Arborist company Heritage Tree Services Ltd. to find sweet Chestnuts Trees that were thought to be 800-1,200 years old! Hugo talked to me about how arborists in England are leaving old stumps of felled trees and often some parts of large branches on the ground (rather than mulching and removing everything) due to current research that microorganisms live on different parts of dead wood--crucial to the health of our overall ecosystem. I appreciated this news for I love dead wood in forests, its usefulness to birds, and beauty. I'd heard of leaving small piles of cut branches in gardens (even a hidden spot in back, but not near the house) so helpful insects and animals can live in the piles, protecting gardens from harmful critters. It felt so relaxing and magical to stay on a friends' new boat-situated on the Thames ("Tims"-your getting it! ), right next to a willow with a view of an alit Temple Island Folly one warm evening. Thank you Darrel, Suri, Hugo, Ingrid and particularly Bell Bookshop for making my stay at Henley-on-Thames so personal, with nature close to my heart. Sweet Chestnut 800-1,200 years old-secret location! I loved this book I found in the Bell Bookshop! Cup of tea (Leslie) and a strawberry shake for local tattoo artist and photographer, Joelle Poulos, at the Hot Gossip Coffeehouse we often frequented due to homemade pastries. Even on the most drizzly and dark Berkeley days of our Mediterranean winter rainy season, I feel as if I’m sitting at a cafe somewhere in the Asian tropics when at Far Leaves Cafe. Outside the cafe window the early evening commute craws by on busy San Pablo Avenue’s sloshy pavement. I sit on an antique, wooden Chinese bed with silken pillows, sipping my hot cup of tea with honey, eating a warm, lavender tinted bao (a sweet taro root steamed bun)—my favorite treat—and munching on mocha laced trail mix. Plants are everywhere at Far Leaves and well tended. All have deep green leaves, no iron deficient, yellow ones that are browning and dying, although I do look after the little potted plant in the corner of the tatami sitting area in the back of the room, for I’m fond of it—no signs of neglect. So I pour a little of my left-over tea water in its pot, only a little, not too hot, if the soil looks dry. The little potted plant has grown over the years from a few feet tall to almost six feet! But I’ve know it since it was little, and its hard for me to see my baby as ever grown-up. I practically wrote my memoir at two Far Leaves shops. The first one was located on College Ave, and now the new and improved cafe can be found on San Pablo Ave in West Berkeley. My debut memoir, which recently got a lovely New York Time’s review, took fifteen years to write. I wrote four hours every Friday, for seven years to complete my original manuscript made up of sixty short stories. I took writing classes and found various editors who advised me sagely on various writing tricks. I read cover to cover The Essential Guide to Getting Your Book Published and Anne Lamott's bird by bird to come up with a proposal (one year to complete) to find my content editor Jay Schaefer. With his advice, I rewrote my manuscript for a year (three eight-hour days a week) and found myself with Cutting Back-My Apprenticeship in the Garden’s of Kyoto’s current twenty-four chapters. I wrote in various tea shops including Crixa Cakes, Cafe Bartavelle, Massies Pastries and more, but the theme was clear. Far Leaves is one of my most frequented cafes due to their large black, green and herbal tea collection and lovely space where I can write. I buy a treat or new pot of tea every few hours to support the cafe if I stay a long time. Each tea drinker gets a pot of water on a burner, with tea pot and cup, so when you finish one pot, you can make another right at your table. The talking volume is always soft and inspiring, food is brought to the table, both sweet and savory. The staff remains consistent and super friendly. Of course I’ve known some of them for 15 years. I mentioned certain employees in the credits acknowledgments of Cutting Back because of their positive outlook (Brad is also a professional personal coach) and creative spirit (Keko is a graphic designer from Japan). I bring them treats occasionally. I love the tatami area in the back of the room, where people can sit around two low tables on a raised mat platform. Tatami mats are made up of many layers of felt, two inches thick, covered in what looks like woven straw—see the Cutting Back website-(“Photo Diary” on the Cutting Back page for an image of tatami and other photos from the memoir) for a visual description of tatami. I bring out-of-town guests here, for we can sit (or lay) around on the tatami area, write letters, read books or catch up over green, black or herbal teas. Today I had Blood Orange tea, brilliant persimmon color, with pieces of ginger, orange skin I can nibble on when my tea has soaked a while. I just dipped my spoon into my honey and nibbled on some soft, reconstituted fruit pieces right out of the pot for an impromptu dessert. Like many Japanese gardens, Far Leaves gives me room to think. And it’s a place for a normally solo pruner to be be around people, like the couple of women sitting nearby me who are talking about world politics, Berkeley’s latest housing troubles, and American history—big subjects. But they had nourishing tea to push them along in thought. It is a tea shop beautifully yet warmly laid out with natural wood, tea accoutrements, tea and plants. Far Leaves is located in a big building, so in winter I sometimes I bring a warm jacket. Thank you, owner of Far Leaves, Donna Lo, and her most generous staff for allowing me time, space and nourishment to grow my stories. Like a plant, my journey began small, and then grew into a large drama about apprenticing in the gardens of Japan. As I write this blog, the bright afternoon light from the big window next to my table now is filled with darkness, and bright-red taillights spin by. But the cafe is still just as warm as on a sunny day, not necessarily in temperature, but atmosphere. Soft white, yellow and red lanterns light up our drinking tea way. Far Leaves has gift tea pots, cups, scarves and even blank books! Tatami sitting area and tables/chairs available along with teapot warmers. Green, black and house-created herbal teas.